Two new studies point to the important role that pressure plays in understanding and creating new ferroelectric materials. Lead-based relaxor ferroelectrics with complex perovskite structures exhibit a strong frequency-dispersive dielectric permittivity with a broad and smooth temperature dependence. Their high permittivity and high piezoelectric constants make them suitable for applications in devices for sonar or medical imaging. While extensive theoretical and experimental studies have advanced our understanding of relaxors, their properties are still poorly understood. These difficulties stem from the complexity of these materials, which have a high degree of compositional, structural, and polar disorder. Using a combination of high pressure synchrotron x-ray diffraction, Raman and Brillouin scattering techniques, Muhtar Ahart and colleagues from Carnegie and Sandia National Laboratory report on experiments revealing that the pressure-induced relaxor-to-ferroelectric crossover in disordered Pb(Sc0.5Nb0.5)O3 is a typical example of such phenomena in disordered perovskite systems and that such behavior can be attributed to the relaxation of polar nanoregions in these systems. The pressure-dependent Raman bands are broad, which is a relaxor-specific spectral signature, and indicate a structural phase transition. A significant softening in the longitudinal acoustic mode is also observed. The similarity in relaxation times found in the temperature and pressure dependencies show that the softening of the longitudinal acoustic mode may be attributed to electrostrictive coupling between polar nanoregions and acoustic modes. X-ray diffraction reveals that the material is characterized by two distinct pressure-volume compression curves below and above the phase transition pressure.This work is a tribute to co-author George Samara from Sandia. 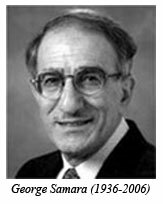 He was a leading figure in the field of ferroelectrics and was the first to demonstrate the importance of the pressure variable in understanding these important materials. He helped launch this CDAC collaboration but passed away in 2006. [M. Ahart et al., J. Appl. Phys., 107, 074110 (2010)]. In a related study, P. Ganesh and collaborators from Carnegie, NIST, Argonne, and Simon Fraser University showed that correlations between chemically ordered regions, which act as polar-nano regions, are responsible for the relaxor behavior in complex relaxors and relaxor ferroelectrics such as Pb(Mg1/3Nb2/3)O3 and Pb(Sc1/2Nb1/2)O3, which are technologically important due to their colossal dielectric and/or piezoelectric response in their relaxor phase. The origin of the so-called relaxor phase in these materials, which show a frequency-dependent dielectric constant that deviates from the Curie-Weiss temperature behavior of normal ferroelectrics, has been a topic of debate for nearly half a century. 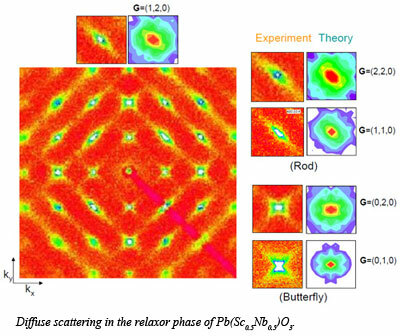 A joint theoretical and experimental study was performed to explain the origin of the characteristic diffuse scattering observed in these materials in their ferroelectric, relaxor and paraelectric phases and investigate their temperature and pressure dependence. The findings suggest a possible route to engineer superior dielectric/piezoelectric materials by nano-engineering different types of chemically ordered regions that will enhance the correlations between the polar-nano regions [P. Ganesh et al, Phys. Rev. B, 81, 144102 (2010)].